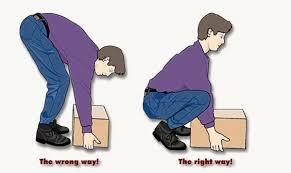 Improper Lifting is a major cause of back pain. We all know that we should bend our knees and let the knees and glutes do most of the work, but do we really think about this when we go to pick up something heavy? Usually not, unless we have already strained our back doing this in the past. I want to encourage you to think about doing this properly BEFORE you have to learn it the hard way. Many problems occur when people bend over from the waist and use only their back muscles to lift an object as they straighten to a standing position. It is important to bend your knees as you reach for the object and to keep your back straight as you return to an upright position. This allows the muscles of your legs to do most of the lifting and avoids straining, twisting, or pulling your back out of alignment. If you have already had an injury from improper lifting or from anything else, Bowen Therapy and LED Light Therapy are excellent therapies to release the muscle tension and pain and to return your musculature to balance and proper spinal alignment. Bowen Therapy tends to last longer than many approaches to pain relief. Call Brenda Briscoe to find out more about Bowen Therapy or LED Light Therapy at 214-679-4618. Or call our front desk to schedule your appointment at 972-930-0260. Find out more about Bowen Therapy at bowentherapyindallas.com. Information taken from The Bum Back Book.